A campaign to improve the working conditions of domestic workers throughout Asia by reaching out to their employers will be launched on Friday 25 September, in Bangkok. 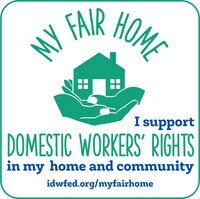 The ‘My Fair Home’ campaign focuses on the employers of domestic workers – encouraging them to personally take the My Fair Home pledge to commit to upholding the rights of domestic workers in their own homes. The campaign is a collaboration between the International Labour Organization (ILO) and the International Domestic Workers Federation (IDWF). My Fair Home is part of the global campaign for the ratification of ILO Convention No. 189 on Decent Work for Domestic Workers – a landmark convention that establishes the first global standards for domestic workers. Convention No. 189 gives domestic workers the same basic rights as other workers, including weekly days off, limits to hours of work, minimum wages, paid overtime, social security, and clear terms and conditions of employment. The provisions of Convention No. 189 only come into force in a country when that ILO member State ratifies it – a process that can be lengthy. The My Fair Home pledge encourages individuals to personally commit to the standards and ethics enshrined in the Convention, without waiting for their national institutions to act. “By encouraging individual employers to personally commit to better working and living conditions for domestic workers, we can create ground up support for national ratification of ILO Convention No. 189 in the region.” said Elizabeth Tang, IDWF General Secretary. “We hope that in taking the pledge, employers take a moment to consider the relationship they have with their domestic worker, and perhaps even sit down together to discuss the terms and conditions of employment” said Anna Olsen, ILO Technical Officer. Domestic workers comprise a significant part of the global workforce in informal employment and are among the most vulnerable groups of workers - the majority of them are women and girls, and many are migrants. Globally there are more than 50 million domestic workers, 21.5 million of whom (41 per cent of the estimated global total) are employed in Asia. Domestic workers’ organisations worldwide – including in Belgium, Hong Kong SAR, Mexico, Nepal, South Africa, Tanzania and Thailand – have started using the My Fair Home campaign as an awareness-raising and organizing tool. Several high profile Ministers and leaders have lent their support to the campaign, including the Indonesian Minister for Manpower and Transmigration, Hanif Dhakiri; the General Secretary of Hong Kong Confederation of Trade Unions, Lee Cheuk Yan; and the Secretary of the Ministry of Labour and Employment of Bangladesh, Mikail Shipur. Members of the press are invited to the launch, at 16:30 on Friday 25 September, at the Palazzo, 111 Soi Niam-Utit, Rachadapisek Road, Din Daeng, Bangkok. English and Thai translation will be provided.